Love watermelon? If so, you're going to love this recipe. 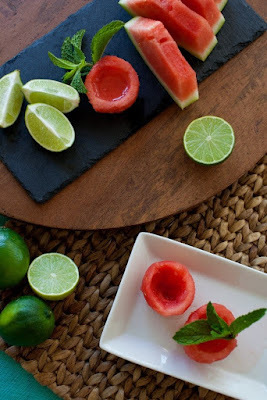 What makes it unique is that you'll use fresh watermelon to make "shot glasses" or "mini bowls" and serve the cocktail directly in them. Super cool and how fun to make these up and serve them at your next party! The recipe is courtesy of our friends over at Sparkling ICE. If you're looking for more easy-to-make cocktail recipes, we've got over 300 of them right here on our foodie blog! How to make watermelon shot glasses: Scoop our watermelon balls with ice cream scooper. Cut slice on bottom to make flat. Use melon baller to scoop out insides. Add one scoop of watermelon to shaker using melon baller. Add lime wedges and Conintreau. Muddle together. Add tequila, juice from one-half lime, and ice. Shake and strain into measuring cup. Add Sparking Ice Strawberry Watermelon. Pour into Watermelon Shot glass. I would enjoy this cocktail. I love watermelon and all Sparkling Ice drinks.